For other uses, see Polygon (disambiguation). Some polygons of different kinds: open (excluding its boundary), boundary only (excluding interior), closed (including both boundary and interior), and self-intersecting. In elementary geometry, a polygon (/ˈpɒlɪɡɒn/) is a plane figure that is described by a finite number of straight line segments connected to form a closed polygonal chain or polygonal circuit. The solid plane region, the bounding circuit, or the two together, may be called a polygon. The segments of a polygonal circuit are called its edges or sides, and the points where two edges meet are the polygon's vertices (singular: vertex) or corners. The interior of a solid polygon is sometimes called its body. An n-gon is a polygon with n sides; for example, a triangle is a 3-gon. A simple polygon is one which does not intersect itself. Mathematicians are often concerned only with the bounding polygonal chains of simple polygons and they often define a polygon accordingly. A polygonal boundary may be allowed to cross over itself, creating star polygons and other self-intersecting polygons. A polygon is a 2-dimensional example of the more general polytope in any number of dimensions. There are many more generalizations of polygons defined for different purposes. The word polygon derives from the Greek adjective πολύς (polús) "much", "many" and γωνία (gōnía) "corner" or "angle". It has been suggested that γόνυ (gónu) "knee" may be the origin of gon. Polygons are primarily classified by the number of sides. See the table below. Convex: any line drawn through the polygon (and not tangent to an edge or corner) meets its boundary exactly twice. As a consequence, all its interior angles are less than 180°. Equivalently, any line segment with endpoints on the boundary passes through only interior points between its endpoints. Non-convex: a line may be found which meets its boundary more than twice. Equivalently, there exists a line segment between two boundary points that passes outside the polygon. Concave. Non-convex and simple. There is at least one interior angle greater than 180°. Star-shaped: the whole interior is visible from at least one point, without crossing any edge. The polygon must be simple, and may be convex or concave. All convex polygons are star-shaped. Self-intersecting: the boundary of the polygon crosses itself. The term complex is sometimes used in contrast to simple, but this usage risks confusion with the idea of a complex polygon as one which exists in the complex Hilbert plane consisting of two complex dimensions. Star polygon: a polygon which self-intersects in a regular way. A polygon cannot be both a star and star-shaped. Equiangular: all corner angles are equal. Cyclic: all corners lie on a single circle, called the circumcircle. Equilateral: all edges are of the same length. The polygon need not be convex. Tangential: all sides are tangent to an inscribed circle. Isotoxal or edge-transitive: all sides lie within the same symmetry orbit. The polygon is also equilateral and tangential. Regular: the polygon is both isogonal and isotoxal. Equivalently, it is both cyclic and equilateral, or both equilateral and equiangular. A non-convex regular polygon is called a regular star polygon. Rectilinear: the polygon's sides meet at right angles, i.e., all its interior angles are 90 or 270 degrees. Monotone with respect to a given line L: every line orthogonal to L intersects the polygon not more than twice. Euclidean geometry is assumed throughout. Exterior angle – The exterior angle is the supplementary angle to the interior angle. Tracing around a convex n-gon, the angle "turned" at a corner is the exterior or external angle. Tracing all the way around the polygon makes one full turn, so the sum of the exterior angles must be 360°. This argument can be generalized to concave simple polygons, if external angles that turn in the opposite direction are subtracted from the total turned. Tracing around an n-gon in general, the sum of the exterior angles (the total amount one rotates at the vertices) can be any integer multiple d of 360°, e.g. 720° for a pentagram and 0° for an angular "eight" or antiparallelogram, where d is the density or starriness of the polygon. See also orbit (dynamics). Coordinates of a non-convex pentagon. in order. For convenience in some formulas, the notation (xn, yn) = (x0, y0) will also be used. The signed area depends on the ordering of the vertices and of the orientation of the plane. Commonly, the positive orientation is defined by the (counterclockwise) rotation that maps the positive x-axis to the positive y-axis. If the vertices are ordered counterclockwise (that is, according to positive orientation), the signed area is positive; otherwise, it is negative. In either case, the area formula is correct in absolute value. This is commonly called the shoelace formula or Surveyor's formula. If the polygon can be drawn on an equally spaced grid such that all its vertices are grid points, Pick's theorem gives a simple formula for the polygon's area based on the numbers of interior and boundary grid points: the former number plus one-half the latter number, minus 1. For any two simple polygons of equal area, the Bolyai–Gerwien theorem asserts that the first can be cut into polygonal pieces which can be reassembled to form the second polygon. The lengths of the sides of a polygon do not in general determine its area. However, if the polygon is cyclic then the sides do determine the area. Of all n-gons with given side lengths, the one with the largest area is cyclic. Of all n-gons with a given perimeter, the one with the largest area is regular (and therefore cyclic). Many specialized formulas apply to the areas of regular polygons. This radius is also termed its apothem and is often represented as a. Using the formulas for simple polygons, we allow that particular regions within the polygon may have their area multiplied by a factor which we call the density of the region. For example, the central convex pentagon in the center of a pentagram has density 2. The two triangular regions of a cross-quadrilateral (like a figure 8) have opposite-signed densities, and adding their areas together can give a total area of zero for the whole figure. Considering the enclosed regions as point sets, we can find the area of the enclosed point set. This corresponds to the area of the plane covered by the polygon or to the area of one or more simple polygons having the same outline as the self-intersecting one. In the case of the cross-quadrilateral, it is treated as two simple triangles. A spherical polygon is a circuit of arcs of great circles (sides) and vertices on the surface of a sphere. It allows the digon, a polygon having only two sides and two corners, which is impossible in a flat plane. Spherical polygons play an important role in cartography (map making) and in Wythoff's construction of the uniform polyhedra. A skew polygon does not lie in a flat plane, but zigzags in three (or more) dimensions. The Petrie polygons of the regular polytopes are well known examples. An apeirogon is an infinite sequence of sides and angles, which is not closed but has no ends because it extends indefinitely in both directions. A skew apeirogon is an infinite sequence of sides and angles that do not lie in a flat plane. A complex polygon is a configuration analogous to an ordinary polygon, which exists in the complex plane of two real and two imaginary dimensions. An abstract polygon is an algebraic partially ordered set representing the various elements (sides, vertices, etc.) and their connectivity. A real geometric polygon is said to be a realization of the associated abstract polygon. Depending on the mapping, all the generalizations described here can be realized. The word polygon comes from Late Latin polygōnum (a noun), from Greek πολύγωνον (polygōnon/polugōnon), noun use of neuter of πολύγωνος (polygōnos/polugōnos, the masculine adjective), meaning "many-angled". Individual polygons are named (and sometimes classified) according to the number of sides, combining a Greek-derived numerical prefix with the suffix -gon, e.g. pentagon, dodecagon. The triangle, quadrilateral and nonagon are exceptions. Beyond decagons (10-sided) and dodecagons (12-sided), mathematicians generally use numerical notation, for example 17-gon and 257-gon. Exceptions exist for side counts that are more easily expressed in verbal form (e.g. 20 and 30), or are used by non-mathematicians. Some special polygons also have their own names; for example the regular star pentagon is also known as the pentagram. monogon 1 Not generally recognised as a polygon, although some disciplines such as graph theory sometimes use the term. digon 2 Not generally recognised as a polygon in the Euclidean plane, although it can exist as a spherical polygon. triangle (or trigon) 3 The simplest polygon which can exist in the Euclidean plane. Can tile the plane. quadrilateral (or tetragon) 4 The simplest polygon which can cross itself; the simplest polygon which can be concave; the simplest polygon which can be non-cyclic. Can tile the plane. pentagon 5  The simplest polygon which can exist as a regular star. A star pentagon is known as a pentagram or pentacle. hexagon 6  Can tile the plane. heptagon (or septagon) 7  The simplest polygon such that the regular form is not constructible with compass and straightedge. However, it can be constructed using a Neusis construction. nonagon (or enneagon) 9 "Nonagon" mixes Latin [novem = 9] with Greek, "enneagon" is pure Greek. hendecagon (or undecagon) 11  The simplest polygon such that the regular form cannot be constructed with compass, straightedge, and angle trisector. chiliagon 1000 Philosophers including René Descartes, Immanuel Kant, David Hume, have used the chiliagon as an example in discussions. megagon 1,000,000 As with René Descartes' example of the chiliagon, the million-sided polygon has been used as an illustration of a well-defined concept that cannot be visualised. The megagon is also used as an illustration of the convergence of regular polygons to a circle. apeirogon ∞ A degenerate polygon of infinitely many sides. To construct the name of a polygon with more than 20 and less than 100 edges, combine the prefixes as follows. The "kai" term applies to 13-gons and higher and was used by Kepler, and advocated by John H. Conway for clarity to concatenated prefix numbers in the naming of quasiregular polyhedra. Polygons have been known since ancient times. The regular polygons were known to the ancient Greeks, with the pentagram, a non-convex regular polygon (star polygon), appearing as early as the 7th century B.C. on a krater by Aristophanes, found at Caere and now in the Capitoline Museum. 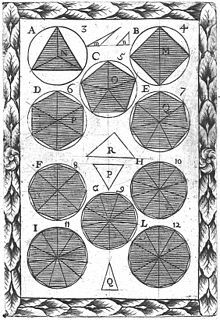 The first known systematic study of non-convex polygons in general was made by Thomas Bradwardine in the 14th century. Polygons appear in rock formations, most commonly as the flat facets of crystals, where the angles between the sides depend on the type of mineral from which the crystal is made. 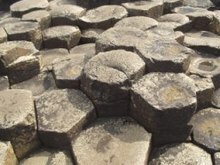 Regular hexagons can occur when the cooling of lava forms areas of tightly packed columns of basalt, which may be seen at the Giant's Causeway in Northern Ireland, or at the Devil's Postpile in California. In biology, the surface of the wax honeycomb made by bees is an array of hexagons, and the sides and base of each cell are also polygons. In computer graphics, a polygon is a primitive used in modelling and rendering. They are defined in a database, containing arrays of vertices (the coordinates of the geometrical vertices, as well as other attributes of the polygon, such as color, shading and texture), connectivity information, and materials. In computer graphics and computational geometry, it is often necessary to determine whether a given point P = (x0,y0) lies inside a simple polygon given by a sequence of line segments. This is called the Point in polygon test. Coxeter, H.S.M. ; Regular Polytopes, Methuen and Co., 1948 (3rd Edition, Dover, 1973). ^ Kappraff, Jay (2002). Beyond measure: a guided tour through nature, myth, and number. World Scientific. p. 258. ISBN 978-981-02-4702-7. ^ Bourke, Paul (July 1988). "Calculating The Area And Centroid Of A Polygon" (PDF). Retrieved 6 Feb 2013. ^ Bart Braden (1986). "The Surveyor's Area Formula" (PDF). The College Mathematics Journal. 17 (4): 326–337. doi:10.2307/2686282. ^ A.M. Lopshits (1963). Computation of areas of oriented figures. translators: J Massalski and C Mills, Jr. D C Heath and Company: Boston, MA. ^ Dergiades, Nikolaos, "An elementary proof of the isoperimetric inequality", Forum Mathematicorum 2, 2002, 129–130. ^ Robbins, "Polygons inscribed in a circle," American Mathematical Monthly 102, June–July 1995. ^ Chakerian, G. D. "A Distorted View of Geometry." Ch. 7 in Mathematical Plums (R. Honsberger, editor). Washington, DC: Mathematical Association of America, 1979: 147. ^ Günter Ziegler (1995). "Lectures on Polytopes". Springer Graduate Texts in Mathematics, ISBN 978-0-387-94365-7. p. 4. ^ Grunbaum, B.; "Are your polyhedra the same as my polyhedra", Discrete and computational geometry: the Goodman-Pollack Festschrift, Ed. Aronov et al., Springer (2003), p. 464. ^ Hass, Joel; Morgan, Frank (1996), "Geodesic nets on the 2-sphere", Proceedings of the American Mathematical Society, 124 (12): 3843–3850, doi:10.1090/S0002-9939-96-03492-2, JSTOR 2161556, MR 1343696 . ^ Coxeter, H.S.M. ; Regular polytopes, Dover Edition (1973), p. 4. ^ a b c d e f g h i j k l m n o p q r s t u v w x y Salomon, David (2011). The Computer Graphics Manual. Springer Science & Business Media. pp. 88–90. ISBN 978-0-85729-886-7. ^ a b "Naming Polygons and Polyhedra". Ask Dr. Math. The Math Forum – Drexel University. Retrieved 3 May 2015. ^ Sepkoski, David (2005). "Nominalism and constructivism in seventeenth-century mathematical philosophy" (PDF). Historia Mathematica. 32: 33–59. doi:10.1016/j.hm.2003.09.002. Archived from the original (PDF) on 12 May 2012. Retrieved 18 April 2012. ^ Gottfried Martin (1955), Kant's Metaphysics and Theory of Science, Manchester University Press, p. 22. ^ David Hume, The Philosophical Works of David Hume, Volume 1, Black and Tait, 1826, p. 101. ^ Gibilisco, Stan (2003). Geometry demystified (Online-Ausg. ed.). New York: McGraw-Hill. ISBN 978-0-07-141650-4. ^ Darling, David J., The universal book of mathematics: from Abracadabra to Zeno's paradoxes, John Wiley & Sons, 2004. p. 249. ISBN 0-471-27047-4. ^ Dugopolski, Mark, College Algebra and Trigonometry, 2nd ed, Addison-Wesley, 1999. p. 505. ISBN 0-201-34712-1. ^ McCormick, John Francis, Scholastic Metaphysics, Loyola University Press, 1928, p. 18. ^ Merrill, John Calhoun and Odell, S. Jack, Philosophy and Journalism, Longman, 1983, p. 47, ISBN 0-582-28157-1. ^ Hospers, John, An Introduction to Philosophical Analysis, 4th ed, Routledge, 1997, p. 56, ISBN 0-415-15792-7. ^ Mandik, Pete, Key Terms in Philosophy of Mind, Continuum International Publishing Group, 2010, p. 26, ISBN 1-84706-349-7. ^ Kenny, Anthony, The Rise of Modern Philosophy, Oxford University Press, 2006, p. 124, ISBN 0-19-875277-6. ^ Balmes, James, Fundamental Philosophy, Vol II, Sadlier and Co., Boston, 1856, p. 27. ^ Russell, Bertrand, History of Western Philosophy, reprint edition, Routledge, 2004, p. 202, ISBN 0-415-32505-6. ^ Heath, Sir Thomas Little (1981), A History of Greek Mathematics, Volume 1, Courier Dover Publications, p. 162, ISBN 978-0-486-24073-2 . Reprint of original 1921 publication with corrected errata. Heath uses the Latinized spelling "Aristophonus" for the vase painter's name. ^ "direct3d rendering, based on vertices & triangles". Look up polygon in Wiktionary, the free dictionary. Wikimedia Commons has media related to Polygons. Weisstein, Eric W. "Polygon". MathWorld.